Harcourt Pear Juice is one of the only pure fresh Pear Juices produced in Australia to today. Careful blending of fruit varieties rewards the consumer with what we believe is the best pear juice available. Subtle seasonal changes in the fruit varieties available are reflected in our juice. Regular Harcourt Pear Juice drinkers will notice these subtle changes from week to week. Harcourt Pear Juice is a valuable source of potassium and natural acids and dietary fibre. But best of all, it tastes great. 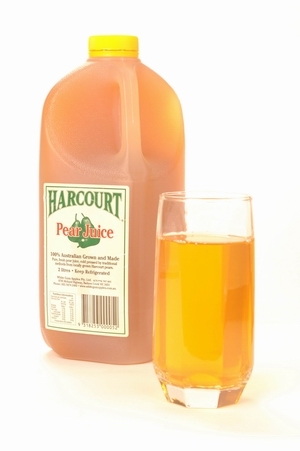 Harcourt Pear Juice is currently available in 2 litre bottles and 15 litre catering pack. A small amount of Sorbic Acid (preservative 202)(42.8g/100L), a natural yeast inhibitor is added to improve shelf life and stop the juice fermenting prematurely.